The MeteoCam Set is based on our unique Live Streaming MeteoCam by Cybex SA and includes all the necessary equipment for continuous live streaming of video and weather data to your page. .. The MeteoBox is a unique solution developed by CYBEX SA that works with your weather station. 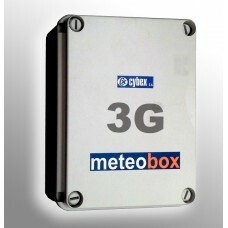 The MeteoBox records the data from the data logger, creates a data base and updates your weather page on the internet. Therefore it can replace your dedicated weather PC offering a much more stable, economic and efficient solution. * Email alerts when wind force and/or temperature is greater than a given value or when temperature drops from a given value and/or rain level is greater than a given value.